Largest online retailer worldwide. Very high conversion, since a lot of clients already have an amazon account. Given the wide product sortiment, additional commissions through additional products in the shopping cart. Must have for every country! Log into the management console at console.aws.amazon.com. Then click in the menu bar above on your name and choose in the menu security credentials. 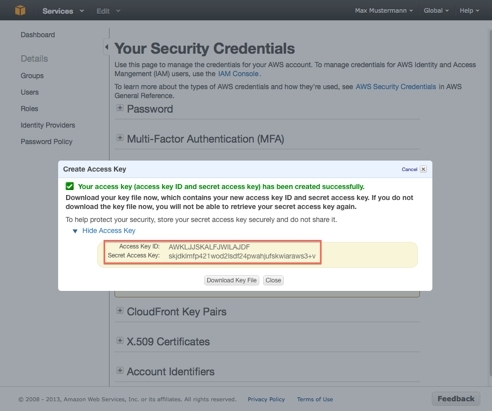 Click then on access keys (access key ID and secret access key) and choose create new access key. In the menu you will find the key and the secret. It is recommended to take down the data, because you cannot access the secret later. 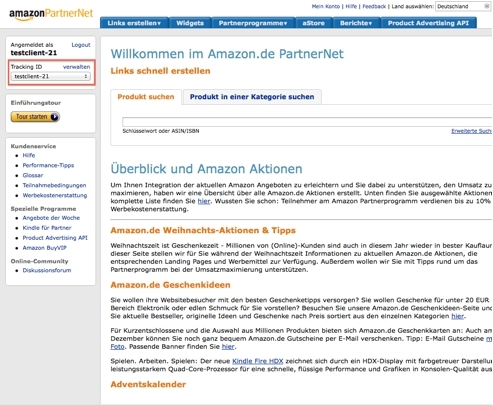 Login to your account at the website of the amazon partnernet of your country. You can find the tracking ID on the left side. If your account is brand new, it takes a short time until the data has gotten around to the Amazon servers. If it still does not work after a short waiting period, the account may not be activated for the product advertising API. The activation can be kicked of manually. You'll find links to all partner pages for every country in the table below. Click on the register now button on the page to connect the accounts with each other. If this is still not working please contact Support. All company names, trademarks and logos are subject to copyright of their owners and are solely used for descriptive purposes.